Blessed are You G‑d, our L-rd, King of the universe, Who has given us life, sustained us and allowed us to reach this auspi­cious occasion. To my wife, Shternie—you are a beacon of strength, wisdom and love. To my children Yankel, Eliyohu, Mendy, Chaya and Yehoshua Elimelech, you are my pride and joy. Words cannot adequately express my gratitude to my par­ents, Reb BenZion and Bassie Raskin, for giving of themselves beyond the call of duty and for giving me everything a son could ask for; to my wife’s parents, Rabbi Shmuel and Devorah Plotkin (Spiritual Leaders of Zhitomer and Berditchev), for their encouragement and inspiration; and to my grandmother, Rebbetzin Chava Hecht, for her unconditional love and directives. To my dear late grandfather Rabbi Jacob J. Hecht, o.b.m., whose remarkable vision continues to guide me through life. I am grateful to everyone who helped make this book a reality. To Rabbi Yonah Avtzon, the publisher of Sichos In English, and Yosef Yitzchok Turner for layout and design. To my edi­tors, Erik Anjou, who gave not only of his pen but also of his heart toward the success of this volume, and to Rochel Chana Schilder, whose wisdom, insights and tireless efforts brought much clarity to the text.To Rabbi Michoel Seligson for citing sources and reviewing the book. A special thanks to Shoshana Brombacher Miller for her beautiful artistic renderings, and to Shlomo Khayms for a great job on the cover design. A special thanks to the following people for their valuable insights: Henry Bar-Levov, Michael Bast, Steven Cohn, Rabbi Mutty Fogelman, Mitchel Garbow, Jason Goldfarb, Rabbi Shimon Hecht, Blanca Madani, Lawrence Obstfeld, Rabbi DovBer Pinson, Stephen Rosen (President and Founder of Congregation B’nai Avraham), Aunt Fradie Sabol, Bella Schapiro, Sara Schmerler, Karen Sebiri, Reb Simcha Weinstein, and Ed Weintrob. Finally, thanks to my second family, the entire congregation of B’nai Avraham. Your commitment and passion for Torah learning constantly inspires me to study more. It is my hope and prayer that this book will stimulate the reader’s interest to delve deeper into our holy Torah. “Great is study for it brings about action.”1 Action tops the scales of salvation and brings about the revelation of our righteous Mashiach. 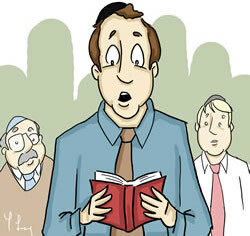 Ethics of Our Fathers 1:17 in Siddur Tehillat Hashem, Kehot Publication Society, Brooklyn, NY. See also Berachos 17a. Toras Menachem, Menachem Tzion, Vol. II, p. 433ff. ; p. 451.